To check the balance of your Gift Card, enter the card number in the field below. Each gift card is assigned a 5-digit pass phrase that is printed on the receipt for online use. 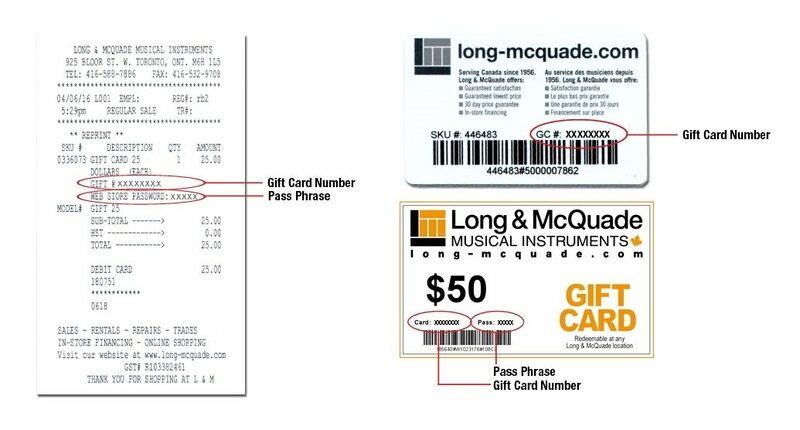 If you do not have this pass phrase, you can obtain it by contacting your local store, sending an email to websales@long-mcquade.com or by calling 1-855-588-6519 (Monday-Friday 9 AM to 9 PM EST; Saturday 1 PM to 9 PM EST). You will need to provide the gift card # along with the name of the person who purchased the card for verification.